The “pivot to Asia” recently announced by Russia requires a massive redistribution of investment resources. Faced with this challenge, Russian authorities are betting on the development of the Far East, the country’s fastest-depopulating region. Plans to stimulate the growth of the region include increasing industrial production, creating a gambling zone and boosting trade. According to the draft of the federal target program, “Economic and social development of the Far East and the Baikal region until 2025”, Russian authorities plan to allocate a huge 3.5 trillion rubles ($53.13 billion) to the region, with 80% of the sum coming from investors. “Such ambitious plans of attracting private investment seem justified, given the serious prospects the region shows,” said Dmitry Bedenkov, chief analyst at Russ-Invest investment company. Finam investment company’s Anton Soroko believes Russia’s economy will be able to get out of the stagnation it finds itself in by forming new partnerships in Asia. “The financial flows are gradually moving away from the EU and the United States and closer to the Asia-Pacific, since this region has all the required resources with next to no administrative barriers, and is developing stronger trade ties with Russia, which is of immense importance for the domestic investors,” he said. There are, of course, some other reasons behind Russia’s interest in its Far East. From 1991 to 2011, the region lost about 22% of its population due to growing mortality rates and emigration, becoming the most rapidly depopulated province of Russia. By early 2012 (no newer data is available at the moment), only around 6.3 million people were living here. The government is expecting to raise 64 billion rubles ($990 million) of investment in 2015, and 243 billion rubles ($3.76 billion) by 2016. The program has begun to show some results. In 2015, for the first time in years, the Far East achieved a natural population increase, with the birth rate surpassing the death rate by 9,334 people. As Russian Prime Minister Dmitry Medvedev said during a cabinet meeting in May, the region has shown “growth rates that are much higher than anywhere else in Russia” in 2014, with a promising growth of 20% in agriculture and 5% in industrial production. The key challenge for Moscow will now be reinvesting the accumulated funds. Russia’s Ministry for the Development of the Far East will create a special fund, to be filled by tax money coming from the investors operating in the region. This means Russia is going to create its first regional sovereign fund. The status; which had earlier helped Hong Kong and Singapore become major trade centres and transformed the Chinese city of Shenzhen from a small fishing village of 3,000 people into a vast metropolis with 15 million inhabitants; usually implies duty-free import of goods. But the measures will not focus exclusively on Vladivostok. 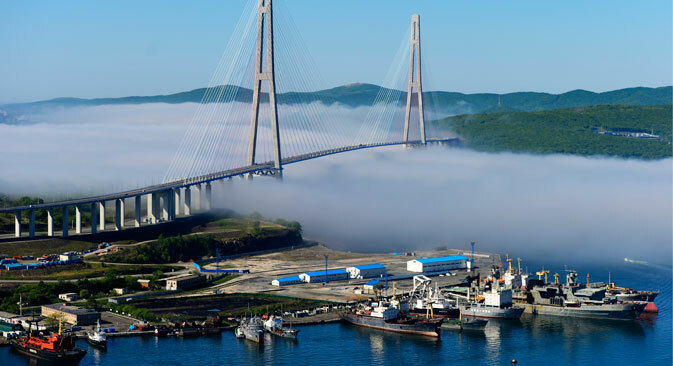 According to Russia’s Association of Sea Commercial Ports, the ports of the Far East handled 135.3 million tonnes of goods in the first ten months of 2014, with the traffic reaching 12.9 million tonnes in Vladivostok alone. Accordingly, the special status will be granted not only to the city’s port, but also to its airport, as well as all neighboring major ports. Apart from customs privileges, port operators will receive tax incentives and the possibility to store cargo without paying fees and get a reduction of the ship call cost. In order to attract attention of investors, Russian authorities have also decided to hold an economic forum in Vladivostok in September 2015. Russia usually holds three major economic forums; one in Vladimir Putin’s native Saint Petersburg, another in the southern city of Sochi, which hosted the 2014 Winter Olympics, and another in Krasnoyarsk, known as the “capital of Siberia”. Each of these forums has its own agenda, with the one in Saint Petersburg enjoying an international status; in 2015, guests included the founder of Alibaba Group, Jack Ma, and former British Prime Minister Tony Blair. The Sochi Forum, supervised by Prime Minister Dmitry Medvedev mainly serves as a platform for the discussion of Russia’s internal economic issues. The Krasnoyarsk Forum gathers think tanks specializing in Russian economy, which undertake joint brainstorming sessions to come up with some new development strategies for Russia. Now, Vladivostok will host the Eastern Economic Forum in 2015, with Vladimir Putin expected to take part in the opening ceremony. According to the organizing committee of the event, about 400 Russian companies, including natural gas monopoly Gazprom, oil giant Rosneft, and Russia’s largest bank Sberbank, have already applied for the participation in the Forum. Among those confirmed as participants is Melco International Development Limited, and its primary benefactor Lawrence Ho, the richest gambling tycoon in Macau.